“Write about Asia” is offered by the East Asia Resource Center in conjunction with the Seattle Asian Art Museum’s Gardner Center for Asian Art and Ideas Saturday University Lecture Series. On March 16, March 30, April 6 and April 27 there will be a lecture followed by a writing workshop which will be facilitated by Mary Roberts. Educators will attend the public lecture from 10:00 – 11:30 a.m. and then meet for a writing workshop from 11:30 a.m – 2:00 p.m. During the workshop, time is given to solitary writing in response to the morning lecture. The workshop will nurture educators as writers through self-reflection and group discussion. Priority will be given to full-time K12 teachers. Teachers must sign up for and attend two or more lectures in the application below. Spaces are limited. This upcoming series is titled “Trans Plants: Collecting, Gathering and Globalizing Plants”. This five-part series will begin with “a consideration of plants in and out of their native environment, and of how plants become an art material in bonsai and Chinese gardens. Hear stories of a delicious mushroom that only grows in the wild, farming eucalyptus as a colonial endeavor, and a hunt for rhododendrons in China” (excerpt from the Gardner Center website). What Kind of Collection Was the Chinese Scholar’s Garden? Free admission to the lecture and four free clock hours are available for attending the lecture and fulfilling online discussion requirements. Registration is on a first come, first serve basis. Current full-time K12 teachers will be given priority. Hear from noted scholars to learn about and discuss how Americans of Japanese Ancestry responded and resisted U.S. military orders that forcibly removed and imprisoned them with out due process or evidence of wrongdoing. The workshop will include an investigation of the landmark U.S. Supreme Court case Korematsu v. U.S. and the relevance to legal resistance and urgent issues of today. Educators will receive KI Curriculum Toolkits that include primary sources. Afternoon Session: KSPS - Injustice at Home Participants will explore teaching resources that emphasize the implications of Japanese American living outside the exclusion zone during WWII. Five short films created by KSPS - along with lesson plans - will examine choices and challenges that people faced, as well as those who stood against prejudice and oppression. To sign up, go to bit.ly/WAeducatorworkshops to register for either workshop. The first 30 teachers per workshop will secure spots. Each educator will receive a $100 stipend and clock hours upon completion of the workshop. The Workshops for Washington State Teachers are facilitated by the Fred T. Korematsu Institute (www.korematsuinstitute.org) and KSPS Public Television, and are made possible with generous support from the Kip Tokuda Memorial Washington Civil Liberties Public Education Program. The Supreme Court Summer Institute provides teachers with a valuable opportunity to expand their knowledge and learn new methods for teaching about the Supreme Court of the United States. Spend six days with high-caliber instructors and expert resource people who lead in their respective fields. Participate in sessions on the certiorari process, judicial nominations, interest groups, the media, constitutional interpretation, and a moot court. Tradition, Exchange, and Innovation in Art: An Introduction to East Asian Visual Culture and Beyond will look at moments in the transmission of culture vis-à-vis art forms produced and transmitted throughout and beyond East Asia. This course will focus on the production of art forms, such as scrolls, woodblock prints, ceramics, and architectural forms as episodes in exchange and innovation. This program is ideal for people who are interested in an introductory course on East Asian art history and cultural transmission, and those who are looking for a refresher on key art historical concepts. During this program, we will compare and contrast artistic productions of different styles and periods, while focusing on translating these artistic examples of tradition, exchange, and innovation into useful classroom materials. This seminar is sponsored by the East Asia Resource Center (EARC), University of Washington, in conjunction with the National Consortium for Teaching about Asia (NCTA). University of Washington, Seattle. May include field trips. Melanie King, Art History faculty at Seattle Central College. The deadline for applying is March 31, 2019. This book club is open to current K-12 in-service and pre-service teachers. The registration fee of $10 includes a copy of the book, a light dinner, 4 clock hours, and resources. Once you register below, you will receive a notification email confirming your spot. You will receive instructions on how to complete your registration by sending a check made out to the “University of Washington”. Once your check is received, a copy of the book will be mailed to you along with a short assignment to complete prior to the meeting. Tokugawa Japan (also known as the Edo era) lasted from 1600 to 1868. This unprecedented time of peace and relative prosperity for Japan were the seeds for what Japan became by the end of the nineteenth century—a powerful colonial power and Asia’s first industrial state. During Tokugawa’s almost three-hundred-year period, Japan’s urban and rural populations were transformed; the art form of woodblock and the Kabuki theater emerged; and a political balancing act, known as the Baku-Han system kept Japan moving forward. As one observer noted, “Tokugawa Japan was pacified, bureaucratized, but not unified.” This seminar will explore Edo Japan’s gender relations, social interactions, religious changes, artistic endeavors, and the Baku-Han system. This hybrid seminar will meet both in person at Boise State University and online. Professor Woods will provide video lectures for the seminar to view after these meetings. Apply by December 1, 2018. An NCTA seminar for middle and high school teachers will be offered in Everett, WA. The Silk Road was not one road but a great network of trade routes, which linked China to Europe and all the lands in between. 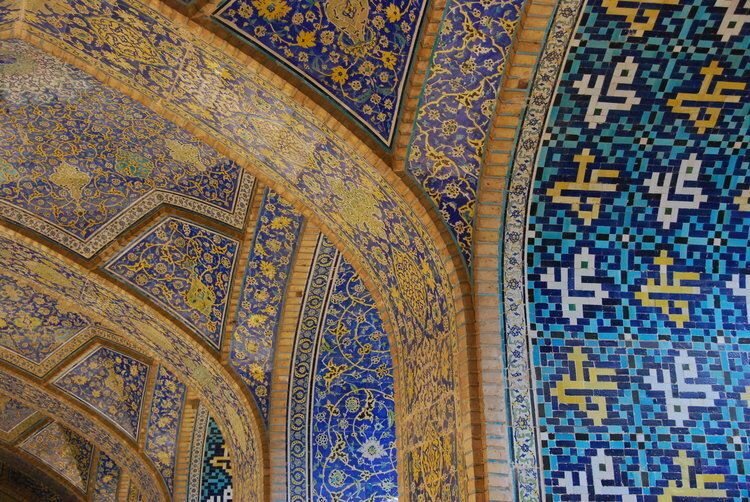 Products were traded, but ideas and beliefs, techniques and works of art were also transmitted, which shaped the civilizations that flourished along the way. In this seminar, teachers will follow the ancient footsteps of merchants, monks and warriors. Teachers will also learn about the Silk Road’s history and examine contemporary Silk Road “explorers” such as Yo-Yo Ma and President Xi Jinping, who recently proposed a $900 billion “new Silk Road” trade/investment plan. The seminar is open to current K-12 inservice and preservice teachers. Space is limited to 20. There is no registration fee, but you must apply below. Priority application deadline is December 1, 2018. China . . . the word itself conjures up visions of the highest mountains in the world, one-fifth of the world’s population, Mao Zedong and his political and cultural revolutions, Deng Xiaoping and his “second revolution” to modernize China and the outcome (a booming economy and the growing division between the have and have-nots), and China’s evolving role on the world stage. With China’s rapid economic development since Mao’s death in 1976, China has become an increasingly complex and dynamic society. How can we integrate China into our teaching and situate China in a global context? How do we support students to read behind the headlines, break down stereotypes and misconceptions, and distinguish between fact and opinion? How can we explore global themes such as sustainability and migration, using China as an example? In order to understand the People’s Republic of China in the 21st century, one must have a basic knowledge of the people, their land, culture and some of the challenges and opportunities facing its 1.3 billion people today. China 101 will attempt to provide you with just that. Tese Wintz Neighbor has traveled extensively around the world, but her heart and soul remain in China. She has lived and worked in both Beijing and Hong Kong and holds a Masters degree in China Studies from the Henry M. Jackson School of International Studies at the University of Washington. She taught East Asian history and culture for more than a decade at Seattle-area colleges and for the past two decades has been teaching an intensive East Asia seminar class for the National Consortium for Teaching about Asia, administered by UW’s East Asia Resource Center (EARC). Tese has led more than 50 tours to Asia and has also worked as a freelance writer for publications such as the Asian Wall Street Journal and the Far Eastern Economic Review. She has written numerous curriculum units on Asia for the World Affairs Council and Newspapers in Education. Ryan Hauck currently teaches AP Comparative Politics at Glacier Peak High School in Snohomish, WA, and is Director of the Global Classroom Program at the World Affairs Council in Seattle. Ryan will provide engaging teaching strategies for making China come alive in your classroom. Resisting the World War II Japanese American Incarceration. 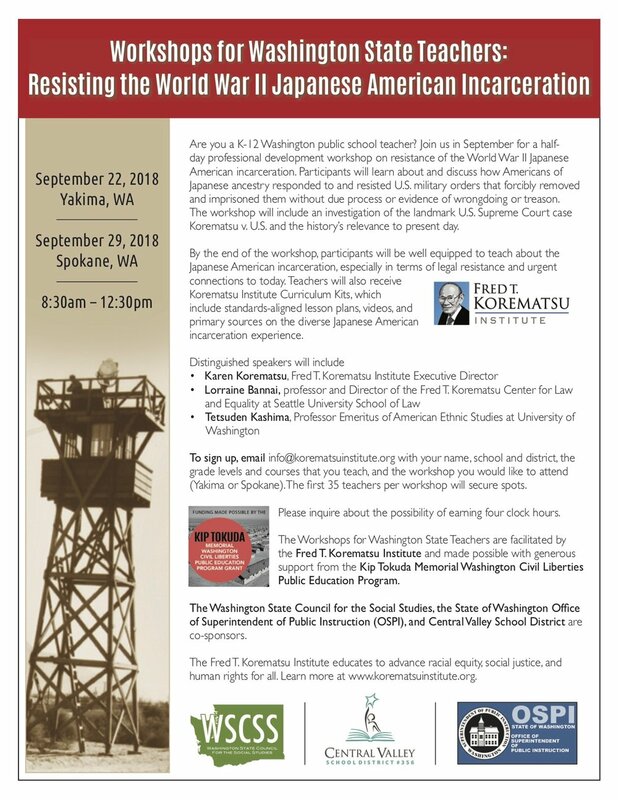 The Bainbridge Island Japanese American Community (BIJAC) through an OSPI Kip Tokuda Civil Liberties grant is co-sponsoring a teacher workshop on the WWII Japanese American Department of Justice Camps experience. The workshop is co-sponsored by the National Japanese American Historical Society and the National Park Service Confinement Sites grant program. In the 1930s and 1940s numerous people living in the United States were identified as “enemy aliens” and placed on a secret government list called the Custodial Detention List. Join your colleagues for open-ended inquiry to consider the question - How did being placed on the government’s Custodial Detention List impact the lives and communities of people of Japanese ancestry? We take a close look at the Custodial Detention List and the political policies and climate that led to the incarceration of both citizens and aliens of Japanese ancestry within hours of the bombing of Pearl Harbor. Through dialogue, primary materials, personal stories, we piece together a more complex narrative and analysis about the earliest government actions, public response, and the trauma, resilience, and resistance of the individuals and communities of people of Japanese ancestry. Materials are written for secondary students, but can be adapted for middle school students. The award-winning documentary film, Honor & Sacrifice: The Roy Matsumoto Story will be shown, and a tour of the Nisei Veterans Hall will also be available. Participants will receive a copy of Honor & Sacrifice DVD, and site license for the film. The workshop is co-sponsored by the National Japanese American Historical Society, San Francisco; the National Park Service, the United Tribes Technical College, and the WA Office of the Superintendent of Public Instruction. There will be a $300 stipend for teachers, free clock hours, and a copy of the DVD "Honor & Sacrifice: The Roy Matsumoto Story" with site license. Lunch and light refreshments. Hear from authors, librarians and fellow teachers and make children’s and young adult books on East Asia a part of your teaching tool kit. Discover how authors do research for their books and how book titles and cover illustrations are selected. Gain confidence in making close readings and exploring character motivations with your students. Find out how to authenticate the reliability of the material and learn about new databases on children’s literature. Using three separate books on East Asia, including Freeman Award winners, teachers will examine three different genres with frameworks to support students’ critical thinking and inquiry. Please refer to the application for additional details and eligibility requirements. Art and Politics: Episodes in East Asian History will consider key moments in the history of East Asia as told through visual and literary responses by artists and writers of the time. Our approach will examine moments in the history of East Asia, beginning with a grounding in philosophical and religious traditions and their influence across space and time. Building on this foundation, we will examine representations and artistic responses to conflict, revolution, and war, which will lead us to a discussion of how we remember and memorialize the past. As we remember, whose stories are told? How do memorials help us remember or forget? Our study will also consider art movements and protests of change that are taking up issues with the government, international relations, the military, the environment, human rights, and a complex, interconnected history of East Asia. Our course material will include primary and secondary source materials, art historical approaches, in addition to resources for inclusion in your classroom. No prior knowledge of the subject matter is required. Discover what you need to know to successfully use, adapt, and develop OER. Clock hours are available, lunch is provided, teams encouraged! Register and get more information! We are upgrading the conference to a new resort location for 2018! Visit the Columbia Gorge, avoid the mountain passes, visit and meet with new friends from across the state, and more. Building Bridges is the theme for 2018! Our featured speakers include UW Professor Turan Kayaoglu, Aneelah Afzali from the Muslim Association of Puget Sound, and Terese Sabila. Summit II will be held January 2018 where we will measure progress and move forward with the Civic Learning Initiative. We are honored to have U.S. Supreme Court Justice Sotomayor join us during this Summit. Justice Sotomayor will participate in a four-hour interactive session with participants from high-quality civic learning programs from our state, meet with law leaders and attend reception for 200. We will also officially launch the iCivicWashington.org. Participants must register by October 10th to guarantee a lunch! Facilitator: free entry- includes one lunch. If there is more than one facilitator, please register separately to receive additional free lunches. Additional lunches are available at $10 each. Resource Fair tables can order lunches during registration. You want to do historical research, but you’re not a trained historian. You want to develop your students’ Common Core research, analysis and interpretation skills. You want to make the most of your History Day project or that big research project that you have just been assigned. What types of research sources should you be using? How do you use the information that these sources provide? What historical sources are—and how to use them. How to use the library system. How to use archival collections. How to find and use reliable online resources. How to properly cite your sources. How to use information from different sources. Teachers are eligible for 3 clock hours provided free of charge through the Cispus Learning Center. 2017 Keynote Speakers: UW Professors Carl Bergstrom and Jevin West! This fall, meet with other Social Studies educators, future educators, university faculty, and staff at the Fall WSCSS Conference. Attend great sessions focused on current methods and the latest content by some of the best teachers from around the state. Start the day with a bang with old colleagues and new friends, learning about ways of teaching students to ferret out the truth with our 2017 keynote speakers, UW Professors Carl Bergstrom and Jevin West as they share their thoughts on Calling BS in the age of Big Data! The date, time, and location of this conference is not yet final. Details will be posted to the K8 Conference page when available. Summit I will be an interactive, participants will see demonstrations from current civics programs from our state. One demonstration will be from Echo Lake Elementary School students sharing their Story Path program. The students will have created their own political parties, selected candidates, campaigned and then elected their own president in two separate classes. The newly elected Presidents will be officially sworn into office by Chief Justice Barbara Madsen in the Temple of Justice. Summit I participants will also see a demonstration of iCivics and hear from Citizen University founder, Eric Liu. Afternoon panels will focus on specific challenges to wide-scale implementation of civic learning and consideration of solutions. Based on our upcoming 2016 Newspapers In Education article series and teaching guide, this workshop will feature presentations by article authors David Bachman, Linda Cuadra and Michelle O’Brien and teaching guide author Tina Gourd. Geared towards high school teachers, we will investigate the complexities and challenges of Asia’s rapidly growing societies and economies. Click here for additional information. Registration closes October 17th.